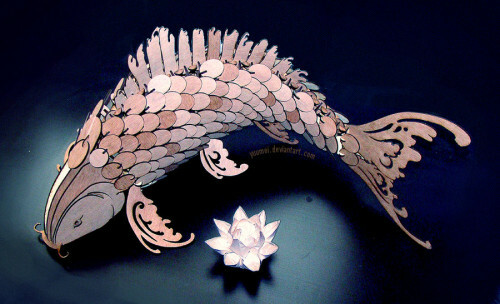 “Koi Puzzle” by Wenquing Yan is a Three-Dimensional Puzzle which moves like a fish would move, from side to side. Initially designed in Maya, then traced in illustrator and lasercut. One can find more of Yan’s work here on deviantArt, which is her primary site. Here is the Koi Puzzle directly. Please read the post carefully. This is not an original post, it is a reblog of another artist’s finished piece and I do not have the original file. I listed the URL to the Yan’s primary site beneath the image but she has not released a ready-to-cut file and I do not believe she intends to. If you observe the photograph closely perhaps you will understand how the model functions and be able to recreate the necessary pieces for yourself.